On Saturday, July 10, NCGS members and friends examined a mile-thick, nearly continuous section of Plio-Pleistocene deposits of the Merced Formation exposed along the coast between Lake Merced and Mussel Rock. Field trip leaders were H. Edward Clifton and Ralph E. Hunter, both retired from the U. S. Geological Survey, and Gregory Bartow with the San Francisco Public Utilities Commission. The Merced Formation is interesting and worth examining for several reasons. First it is a significant groundwater aquifer for San Francisco and San Mateo counties. Second it provides an excellent record of sea level variations in the Bay Area preserved in a series of 41 well-defined parasequences. The day began in heavy fog with a cold wind blowing fiercely off the ocean, but by lunch time the fog had lifted and we had a beautiful day. We started the trip near Mussel Rock and over the course of the day hiked north along the coast for about 3 ½ miles to end our trip near the Fort Funston hang-glider park. We began by crossing the San Andreas Fault where it moves from onshore near Daly City to the offshore near Mussel Rock. The Merced Formation is the aquifer for the Westside groundwater basin that underlies portions of San Francisco and San Mateo County. Groundwater was originally pumped from the Westside basin in San Francisco between the late 1800’s and 1930 for drinking water. Groundwater supplies were largely abandoned when imported Sierran water become available in the early 1930’s. Today the basin provides up to 50% of the drinking water for 200,000 residents in northern San Mateo County. In San Francisco, groundwater is mainly pumped for irrigation. Water levels vary from 50 feet above sea level in the Sunset District in San Francisco to 200 feet below sea level in Daly City. As part of the San Francisco Public Utilities $3.6 billion capital improvement project, three groundwater-related projects are in the planning stage. The first project is to drill water wells in the Sunset District. This area is the last customer on the Hetch Hetchy pipeline and needs to secure a more immediate water supply. A second project is to find supplemental water for Lake Merced. Lake Merced is a 300 acre fresh water lake that is the surface expression of the shallow ground water table. It originally had a small outlet to the Pacific that was dammed to make the present day lake. A third project is to store water in the unsaturated zone above the current ground water level in Daly City. Here the water level is 100-200 feet below sea level due to pumping. Up to 75,000 acre-feet would be stored. For comparison there are only 69,000 acre-feet in the Crystal Springs reservoir. In a form of ground water banking, Daly City would stop pumping ground water from the Merced Formation, and in return it would be supplied with water from San Francisco. The Merced Formation is defined in the subsurface by numerous water wells, and surface outcrops are well exposed along the cliffs from Mussel rock to Fort Funston. 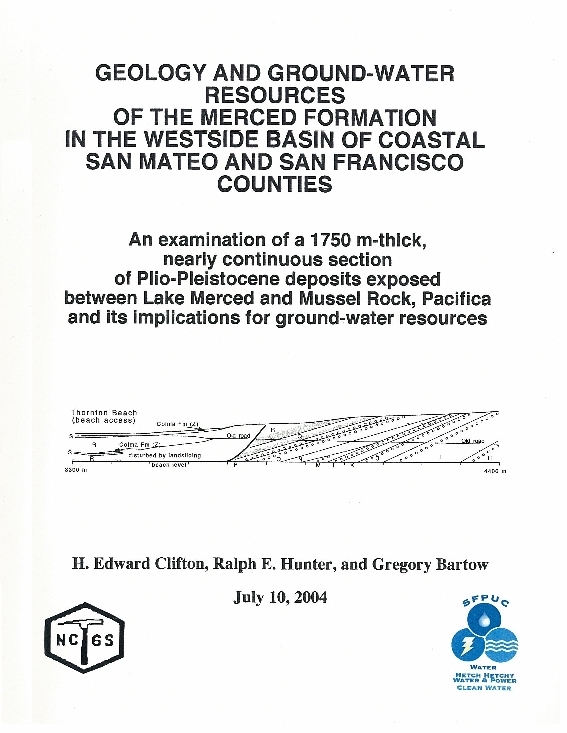 The Merced Formation lies within the Westside basin on the peninsula and within the Eastern San Gregorio basin in the offshore. The bedrock in this area is the Franciscan Formation and it slopes westward beneath the Pacific. The Merced Formation overlies the Franciscan and thickens from the middle of the peninsula to the west beneath the ocean. The greatest thickness in the Westside basin is found in an elongate northwest-southeast trending trough. The trough is bounded on the southwest by the San Andreas Fault and on the northeast by the Serra Fault. The Serra Fault is a southwest dipping reverse fault with the west side thrust up relative to the east side. It has deformed the Merced Formation along the coast. The fault appears to be an impermeable barrier because the ground water level is lower in the Westside basin than to the west of the fault. The uplift of the Merced Formation along the coast probably occurred within the last 100,000 years. The uplift was the result of compression on the plate margin due to oblique convergence of the Pacific and North American plates along the San Andreas Fault. The cliffs are being uplifted at a rate of about 1 mm per year. The Merced Formation consists of an accumulation of sediments over one mile thick (1750 meters). The sediments were deposited almost continuously in the late Pliocene to early Pleistocene during the last two to three million years. The exact ages are uncertain because age dating is a problem in the section. There are many fossils, but most of them have no age significance. However, there are Pliocene age fauna in the lower portion of the section. The formation has been divided into a series of 41 units labeled from Z at top decreasing to A in the middle of the section. Below A the labeling continues from ZZ decreasing to LL near the base of the section. Each of these units is a parasequence in the sequence stratigraphy framework. The sediments of the Merced Formation are weakly consolidated fine sandstones with secondary siltstones and claystones. They were deposited in environments thought to range from marine to non-marine. Individual depositional facies include shelf, nearshore, foreshore, embayment, backshore (sand flats), marsh, dune and alluvial facies. The lower 1300 meters of the section (below sequence J) are mainly marine facies while the upper 300 meters are mainly non-marine facies. The facies in the Merced Formation are arranged in sequences that indicate alternate regressions and transgressions of the sea. The origin of the regressive-transgressive cycles in the Merced is uncertain. The Merced section is dominated by shallowing-upward regressive sequences formed by a prograding shoreline, possibly in conjunction with a falling sea level. There is a systematic upward shallowing from shelf to nearshore to foreshore to backshore to eolian dune facies. In this section there are bioturbated silts of the outer shelf, followed by laminated silts and shell lags of the mid shelf, fine sands and shells of the inner shelf, pebbles and fine sand of the lower shoreface, cross-bedded sand and gravel of the upper shoreface, planar bedded sand and gravel of the foreshore, clean sand and root structures of the backshore (non-marine), and lignite at the bay flooding surface. Most sequences do not display all of the facies. However, 27 of the 41 sequences show evidence of upward shallowing in a coastal setting. Most of the progradational sequences are bounded at the top by surfaces of erosion. These surfaces were formed during the marine transgressions that separated the progradational periods. The transgressive intervals are not marked by a simple reversal of the regressive sequences because the landward translation of the shoreface tends to cause the nearshore, foreshore, and non-marine deposits to be eroded. The hiatus is generally marked by a lag deposit of pebbles or shells. The transgressive surface of erosion is also known as the ravinement surface. Overlying the erosion surfaces are sediments deposited in increasingly deeper water. These are deepening-upward transgressive sequences formed by the shoreline receding landward, possibly due to rising sea level. We began our hike in the lower portion of the section near Mussel Rock and worked our way to the upper part of the section near Fort Funston. Several of the units had interesting and easily observable features that are worth noting. In the shoreface section of unit MM we observed adhesion ripples that formed as dry sand sticks to small wet dunes and the dunes then grow in a windward direction. Unit NN was a typical progradational sequence in the lower portion of the section containing shelf and nearshore depositional facies. At its base is a thick massive sand sequence deposited in deep water (100 meters?). At its top are shell hash beds also deposited on the shelf but above storm wave base (20-30 meters?). Unit RR was a good example of transgressive deposition. It overlies bay or estuary facies of Unit QQ that contains lignite. At its base is mudstone with marine mollusks. This is overlain by a layer of shells in growth position possibly indicating a tidal channel. This in turn is overlain by marine gravel. Near the top of the section in Unit P there is an abrupt mineralogical change. Below P the clasts in the section are derived from the Franciscan Formation, while above P the clasts are from Sierran granites. This change in clast origin is due to formation of the modern drainage of Sacramento and San Joaquin rivers. This modern drainage occurred when the ancient lake in what is now the San Joaquin Valley burst through the Golden Gate, and allowed sediments of the Sierra Nevada to be deposited offshore. There are several ash beds in the section. Unit S contains an ash bed with a maximum thickness about six inches called the Rocklin ash. This ash was deposited by the eruption of ancient Mt. Tehama about 610,000 years ago. Mt. Tehama was eroded during the ice age and today Mt. Lassen (located about 300 kilometers to the northeast) is a volcanic plug located on the flank of the former volcano. In the non-marine environments of the upper section near the Fort Funston hang-gliding park are faunal remains. This sub-aerial environment is an embayment facies (probably a sand flat). Here mammoth bones and teeth have been found, as well as footprints of large canines and elk- or deer-like animals. The NCGS sincerely thanks Ed, Ralph, and Greg for leading this excellent field trip and providing the field guide describing the trip in detail. We thank Tridib Guha for organizing the trip, handling trip registration, and arranging transportation. We thank Tridib and Dan Day for their continued hard work getting coffee, donuts, lunches, and refreshments.